The photo above is of the Chicago landscape at night. I had the pleasure of seeing a similar image as I flew into Midway airport recently. I was mesmerized as I looked out my window and could not peel my eyes off the glittering landscape below. During daytime one can usually discern the layout of a city by the blocks and ribbons of white and red lights on the road. However, at night, cities frequently turn into patches of fuzzy yellow light and darkness. Chicago is startling, for the logic of the city is actually more apparent at night than during the day. This view illuminates Daniel Burnham‘s genius. Chicago’s grid – not quite radiating, but rather flowing – from its central loop is traced by row upon row of perfectly aligned street lights. The grid at once appears startling simple – straight lines conversing an entire city – and and overwhelmingly complex – thinking of how many people utilize that landscape, and for how many purposes. Moreover, as a directionally-challenged individual, I love seeing straight streets, logically spaced, running perfectly north, south, east and west. Perhaps it also arises from my love affair with Philadelphia’s Penn-laid grid. In my opinion, cities are one of the greatest creations of man. Cities themselves are organisms, incredibly complex and beautiful. There is an astounding brilliance in the operation of a great city. 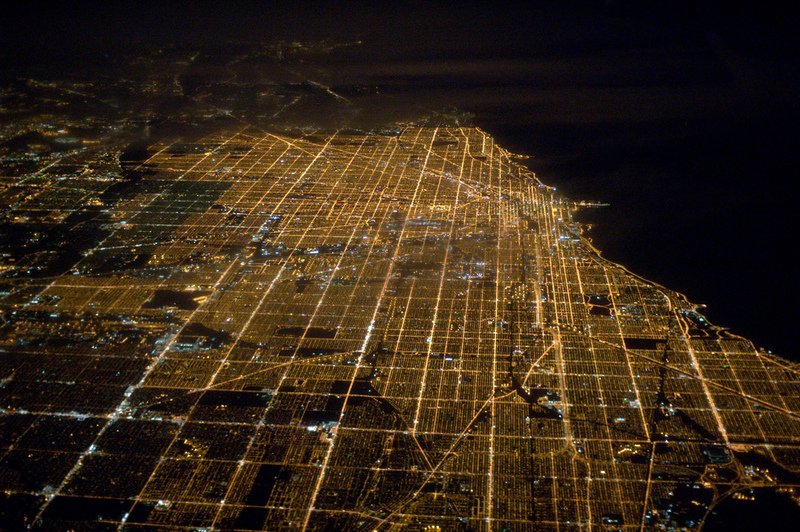 The grid of Chicago makes the city look both like a beautiful organism and an astounding machine. Each city has its imperfections, but the night view makes Chicago glimmer. Being a public transit person creates a lot of conversation, especially with people living in urban centers. 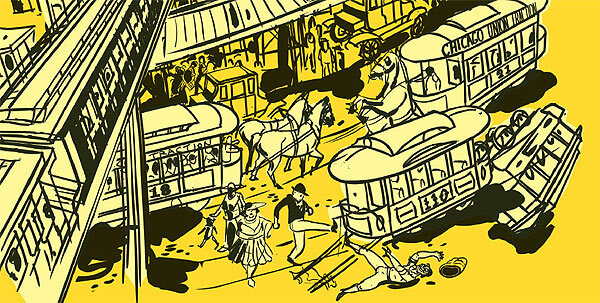 Everyone has a public transit story, or complaint, or idea. Transit is the great commonality in cities, not merely as conversation, but as public space and property as well. It is this latter piece, as public property and space that mystifies some people. At least a handful of people have argued to me that public transit should be privatized or at least support itself financially without any sort of public subsidy. Ironically, these seem to frequently be the same people that are upset that public transit has not made one sort of accommodation or another, whether it is for the handicapped, or enough service, or insufficient cleanliness. I am in no way against economic efficiency in the sense that transit systems should work to keep costs down. However it is problematic when transit systems are expected to fend for themselves financially (as Governor Christie seems to desire for NJ Transit). Such a system results in a terrible combination of higher fares, less service, and greater inaccessibility for those who least can afford such cutbacks. The dream of municipal ownership finally became a reality in 1947, when the Chicago Transit Authority was formed to take over the bankrupt transit lines. Finding enough money to run the CTA has been a problem ever since. “A transit system that was unable to survive on fares as a private enterprise was somehow expected to do so as a public entity in a declining market,” Young wrote. The all-time high for public-transit use in Chicago was the late 1920s, he says, when the city’s streetcars, buses, and trains annually handled more than 1.1 billion rides. In 2009 the CTA handled 521 million rides, not quite half as many. This history is not unique to Chicago and Loerzel’s article is informative for residents of all cities, not just Chicagoans. Moreover, the lessons regarding transit apply to all public services (e.g. police, health care, roads, energy, water, etc.). Based on those of my peers who have suggested privatizing transit I think many are just deluded by Reaganomics. The others who believe more sincerely in privatization usually have more sinister anti-urban or racist or classist goals that go along with cutbacks in public transportation. In these tough financial times it is difficult to find money for all services. However, suggestions to privatize our public transportation systems is not the answer to our woes. Private companies will not put people first, but rather profits. The good of our cities depends on continuing investment (and reasonable expectations of sound fiscal policy with that investment) in our great public properties and spaces, our transportation systems.